Red hair might not be common naturally, but that doesn’t stop people from dyeing their hair in order to achieve this fiery hue. In order to get a really vibrant and healthy-looking color, you need to find the right dye, and treat your hair properly after coloring. With plenty of hues in both permanent and semi-permanent formulas, you’re sure to find a red hair color to suit your needs. And if you’re not ready to change your hair color with a dye, you might find that a lace wig is a great alternative to update your look. Finding the best red hair dye for your at-home coloring needs means reading reviews, studying product features, and diving into the ins and outs of available hues and configurations. With the right red hair dye, keeping your roots at bay and your color vibrant can become a quick, over-and-done with task. We reviewed dozens of red hair dyes to identify the best of the best, based on Amazon reviews, how well they stood up to washing, cost, and other considerations. We narrowed our search down to 5 of the top-rated red hair dyes people can purchase to ensure a vibrant and healthy-looking result. Delivers super shiny, fade-free luminous hair color. 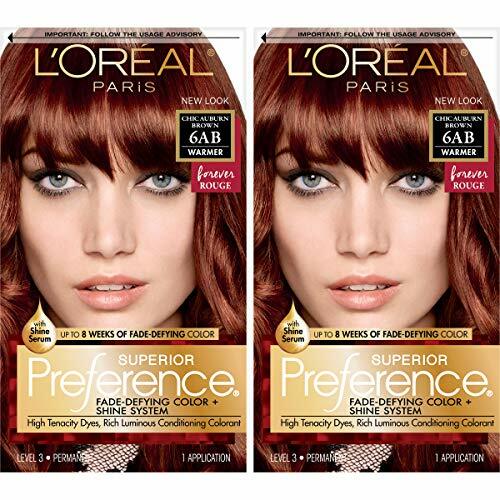 We’ve identified L’Oreal Paris Superior Preference Permanent Hair Color, 6ab Chic Auburn Brown as the best red hair dye out there. With fade-defying color that lasts for up to eight weeks, this red hair dye is one that will have your hair looking tip top shape. These benefits allow you to easily switch up your color with less hassle. L’Oreal Paris Superior Preference Permanent Hair Color, 6ab Chic Auburn Brown took the top spot on our list of the best red hair dyes thanks to its fade-defying formula that lasts for up to eight weeks. Thanks to its formula which offers both highlights and lowlights, it provides a more natural, luminous color. It comes complete with a color protective Care Supreme Conditioner containing camelina oil, vitamin E, and UV filter. Those who purchased and reviewed this red hair dye appreciated how soft and shiny their hair was after dyeing. People found that the color was true to the box, didn’t cause a lot of hair loss, and didn’t stain skin too much. Some found the chemical smell a bit overwhelming, which is common with at-home dyes. Using in a well-ventilated area can help. With a price tag of $17 for a two-pack, it’s a surprisingly affordable option for at-home coloring, and the quality craftsmanship associated with the brand, as well as the ease of use more than justifies that price. It has a rating of 4.0 on Amazon with more than 1,600 people reviewing it, which we think goes a long way in convincing those looking for a color change to make the investment. Vivid color intensity and premium performance in an at-home formula. Schwarzkopf Color Ultime Hair Color Cream, 5.22 Ruby Red took the runner-up spot on our list of the best red hair dye, and provides a rich and vivid result. The premium permanent coloring formula provides vibrant color for up to 9 weeks at a time, so you can go longer between treatments. This dye boasts a unique Diamond Brilliance Serum that provides noticeably brilliant color results and incredible shine. Those who purchased and reviewed this red hair dye appreciated that it offered a quality result without the need to bleach hair beforehand. Several people commented that they found this dye washed out more slowly than other brands, and was true to the shade selector on the box. At a cost of $10 per box, this red hair dye is a surprisingly affordable option for at-home coloring, and the quality associated with the brand, as well as the ease of use more than justifies that price. It has a rating of 4.3 on Amazon with more than 230 people reviewing it, which we think goes a long way in convincing people to make the investment. An at-home hair color that delivers natural-looking, rich, multi-tonal color from root to tip. 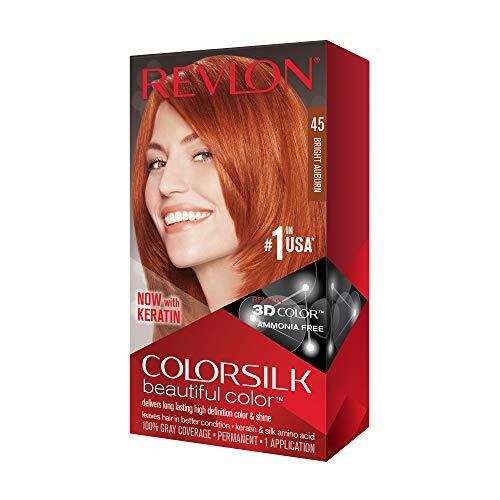 Revlon ColorSilk Beautiful Color, Bright Auburn is an excellent choice for those who want a red hair dye that won’t break the bank. It provides long-lasting, high definition color in an easy to apply gel formula. Multi-tonal color provides a natural-looking result, and contains a keratin and silk amino acid blend that helps that helps to leave hair in even better condition after coloring. Those who purchased and reviewed this red hair dye appreciated that the liquid gel formula was easy to apply, and that it provided a natural-looking result. Those with delicate hair found this dye was gentle on their hair, and that there was very little smell. Several people commented that the included conditioner left their hair feeling super soft and hydrated. With a price tag of approximately $6, this red hair dye is a solid choice for those looking for a red hair dye option on a budget. It has a rating of 4.2 on Amazon with more than 200 people reviewing it, which we think goes a long way in convincing people that this budget-friendly pick is just as good at dyeing hair as its more expensive counterparts. A cream formula semi-permanent hair color. 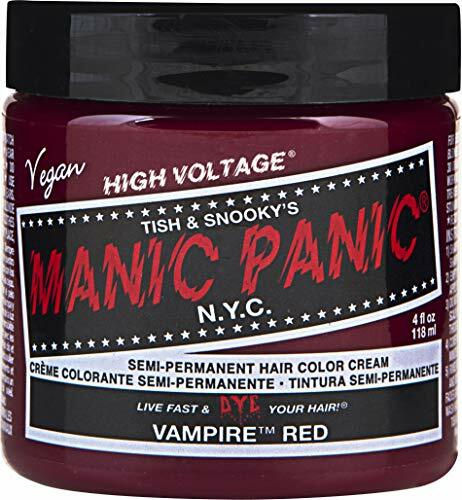 Manic Panic Vampire Red Hair Dye is an ideal choice for those who are looking for a red hair dye, without the commitment of a permanent solution. It boasts a cream formula that is easy to apply to all hair types, and provides a rich, vibrant color without a major commitment. If you’re looking for a more vibrant result, you can pre-lighten hair with one of the brand’s bleach kits, or simply enjoy a less intense result on its own. Those who purchased and reviewed this red hair dye appreciated that it provided coverage to even the darkest of natural hair colors, and that the cream formula went on without hassle. People were able to leave it on for extended periods of time without damaging hair, and liked that it could wash out somewhat easily. With a price tag of around $10, it’s not outrageously priced, and the quality craftsmanship associated with the brand, as well as the ease of use more than justifies that price. It has a rating of 3.5 on Amazon with more than 5,300 people reviewing it, which we think goes a long way in convincing those wanting to change up their color without a huge commitment to make the investment. High quality professional hair coloring system with no developer necessary. 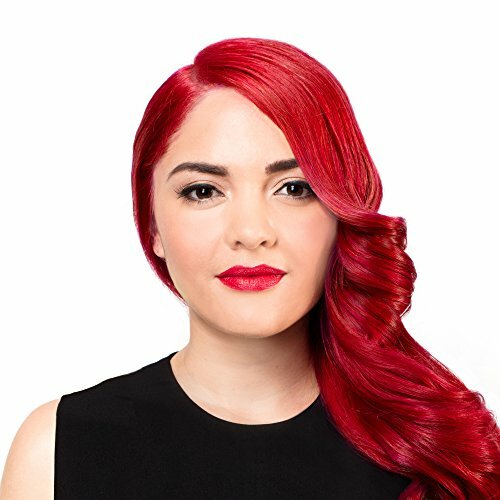 Sparks Long Lasting Bright Hair Color, Red Velvet is a wonderful choice for those who aren’t afraid to commit to the red hair life, and offers a high quality professional hair coloring system at home with easy step-by-step instructions. There’s no special bleaching or developer required, and it is suitable for use on all types of hair. When used with the brand’s Crystal Clear as a top coat, it adds impeccable shine to your color results. Those who purchased and reviewed this red hair dye appreciated that it provided a true and vibrant color. Several reviews mentioned that this color didn’t wash out as quickly as others on the market, and left their hair feeling soft and shiny. People did mention that this dye does stain anything it comes into contact with, so be very mindful when applying it. At a cost of about $5, it’s pretty affordable, although you might need multiple tubes to cover your hair depending on the length. The quality results, as well as the ease of setup and use more than justifies that price. It has a rating of 3.5 on Amazon with nearly 2,000 people reviewing it, which we think goes a long way in convincing people to make the investment. A red hair dye is an ideal choice for those who want to switch up their natural hair color to a more raven hue. Nearly anyone can dye their hair red if they like, and doing so at home is often significantly less expensive than having your hair colored at a salon. Whether your hair is light or dark, straight or curly, there is an at-home red hair dye that’s right for you. With plenty of hues in both permanent and semi-permanent formulas, you’re sure to find a red hair color to suit your needs. If your hair has been previously colored, you are best to do a strand test before applying the dye to your entire head of hair, and you might even want to consult with a professional colorist. If your hair has never been colored before, you should be good to go, but it’s always wise to do a strand and allergy test before doing a full application. Permanent vs semi-permanent. Arguably the most important consideration when it comes to choosing a red hair dye is the type of formula. Permanent dyes will offer a permanent, longer lasting result than a semi-permanent dye will. Red is a notoriously hard color to maintain, and you’ll want to be mindful of how frequently you wash as color will bleed each time. Shade. The next most important consideration when it comes to picking a red hair dye is the shade of red you choose. Most dyes include a color chart on the side of the package that shows you what result you can expect based on your starting hair color. That said, you should still perform a strand test ahead of coloring in order to be sure you’ll like the results and get timing correct. Conditioner. Dyeing your hair, especially red, can wreak havoc on the condition of your hair. Look for dye kits that contain added conditioners in the formula — avocado oil, shea oil, and other oils are all good ingredients — as well as a post-dye conditioner. Price point. Finally, consider how much you are willing to spend on a red hair dye. Red hair dyes vary in price from $5-$30 or more. You can frequently find manufacturer coupons or sales that can make buying a red hair dye more affordable. Depending on whether you choose a permanent or semi-permanent hair dye will factor into how quickly your red hair dye will fade. Also, the more frequently you wash your dyed hair, the faster it will fade. The longer you can do between washes, the longer your color will remain vibrant looking. You can make red hair dye last longer by avoiding washing it too much. When you need to wash it, ensure you use a color-safe shampoo and conditioner in order to help protect the color. Using cool or lukewarm water will help preserve the color longer than using hot water will as well. Many red hair dyes come with a special conditioner to help preserve your color, so use as directed to help maintain the color. Finally, avoid applying heat to your dyed hair, including blow drying, and using a curling iron or straightener. How soon can I recolor my hair at home? Hair care experts generally advise that people wait at least four weeks before recoloring their hair at home. This helps to ensure that hair does not become too damaged from the dyeing process. If possible, you should wait up to 8 weeks before recoloring your hair. The stronger your hair is, the more frequently it can withstand at-home dye jobs. If you absolutely cannot stand the results of your at-home dye job, it’s probably best to seek the professional advice of a salon colorist in order to help transition your color. What’s the difference between semi-permanent and permanent red hair dye? Semi-permanent red hair dye doesn’t contain any chemicals, such as ammonia or peroxide, and as such it wears off in about three weeks or so, whereas permanent red hair dye contains slightly more chemicals which make it last around 8 weeks or longer. Semi-permanent red hair dye is less maintenance than its permanent counterparts, and since it fades out a bit more than permanent dyes, it tends to provide a more natural transition between colors. Permanent red hair dye will fully cover gray strands, but requires regular upkeep to maintain roots as hair grows. We looked at 20 other red hair dyes. Even though they didn’t make our 5 best red hair dyes list, they’re the best of the rest and each is still a great option for coloring your hair at home. The information you’ll need to compare each one is included with the listing. This semi-permanent red hair dye provides a rich, velvety deep red color that works especially well with brunette hair. It also conditions hair while you color, to help prevent drying and damaging. This semi-permanent red hair dye provides a deep crimson red hue in as little as 30 minutes. It has been manufactured in the USA, and contains no harmful chemicals. This semi-permanent red hair dye provides a bright, shiny red hue to strands, and gently conditions as it colors to give hair a beautiful, soft feel. This semi-permanent red hair dye provides a vibrant, bright color and contains a vegan keratin complex to help your hair look healthy and strong. Made in the USA, it’s also vegan and cruelty-free. This semi-permanent red hair dye boasts a concentrated pigment formula for brighter color, and comes complete with a sleek tint brush for easy application. This semi-permanent red hair dye is ideal for those with blonde or light brown hair, and fades naturally without harsh root lines for a more natural appearance. This red hair dye can be used as a temporary color without the application of heat, or as a semi-permanent solution with a touch of heat for added convenience and versatility. This semi-permanent red hair dye provides stunning high fashion results in a low-maintenance formula. Root regrowth is nearly invisible as the color gently fades and washes out. This permanent red hair dye is an ideal choice for those with ethnic hair who want to try out a red hue. It can be used on both relaxed and natural hair for added convenience. 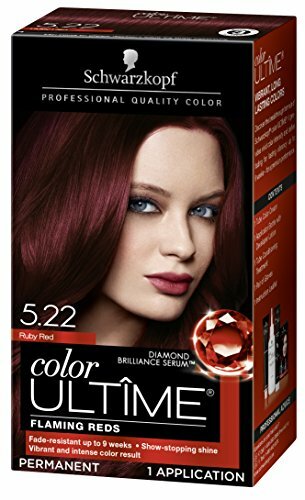 This permanent red hair dye boasts a unique formula that is ideal suited for those with darker hair. It provides rich color and coverage in as little as 30 minutes. This permanent red hair dye provides up to 8 weeks of bold bright color, and has been designed to provide shiny, healthy-looking hair after each use. This permanent red hair dye provides beautiful, even color from root to tip, and contains a blend of rich conditioners to help nourish hair from the inside and outside. This permanent red hair dye provides natural-looking coverage thanks to its color blend technology, which combines three salon tones and highlights in one simple application. This permanent red hair dye boasts a non-drip, velvety cream formula with a pleasant floral scent. It helps improve the shine and softness of hair as it colors thanks to its exclusive 60% oil blend. This permanent red hair dye provides an ultra deep red hue for those who really want to stand out. It contains nourishing macadamia oil to help hair look and feel its best. This permanent red hair dye provides a healthy-looking hue that won’t wreck or ravage your hair. The expertly-blended formula provides multi-faceted shimmering color for a natural appearance. This permanent red hair dye boasts a non-drip creme formula, and comes complete with a nourishing blend of vitamin C, argan oil, and keratin to help hair look healthy and shiny. This permanent red hair dye provides a vibrant red hue, and contains a nourishing blend of four oils to help protect hair as it colors. It provides up to 8 weeks of shiny, silky-looking hair. This permanent red hair dye has been specially formulated for those who want a healthier way to color their hair, as it uses natural, plant-based ingredients.